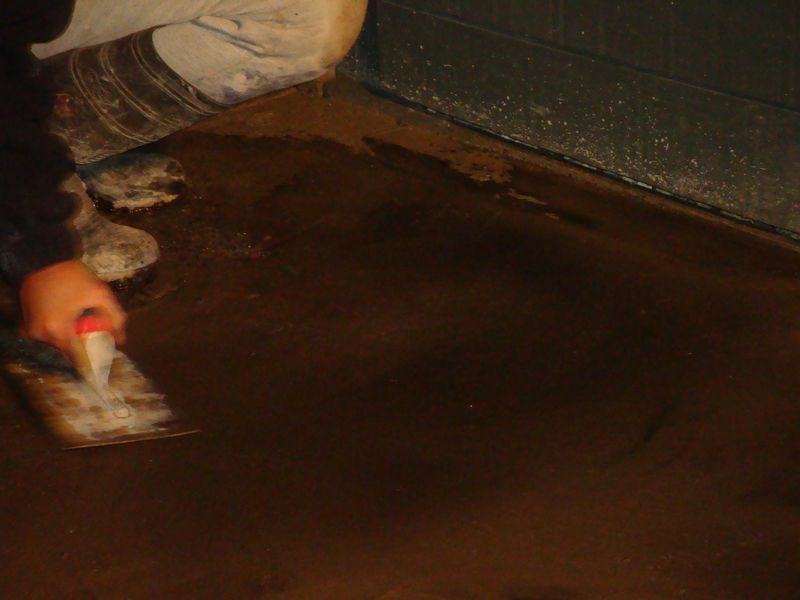 Images and a video showing the process of a Concrete slab construction, with 3mm crushed glass tamped into the RC 25 fibre concrete, a black cement dye will be added once the power float pan is able to be positioned on the slab. The curved wooden retainer to the turf has been staked and screwed into position and the remaining turf laid to the edging strip. Additional stone has been brought in, raked and levelled to allow for a 100mm concrete slab. Once levelled the subbase has had 3 passes with a wacker plate, a sand blinding was then applied and a dpm or visqueen 1200 gauge membrane to stop damp coming up through the slab. 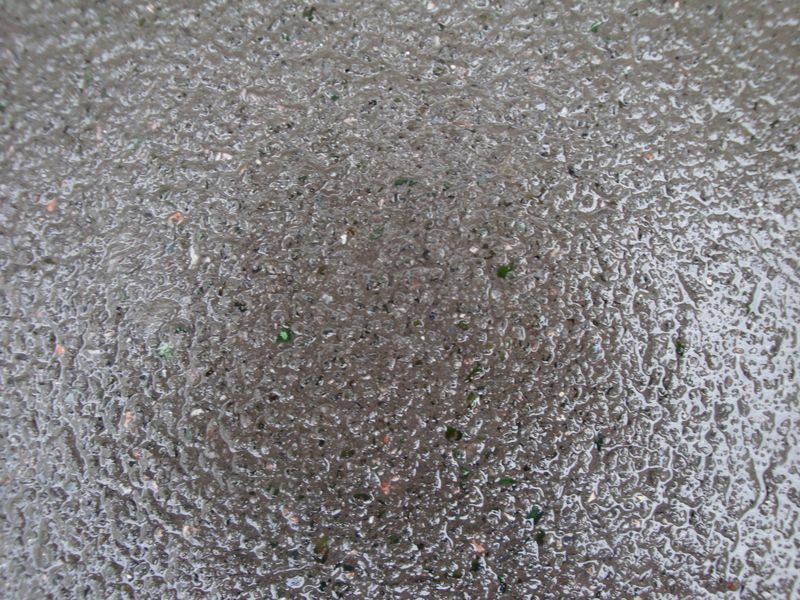 The RC 25 60 slump concrete is poured to the correct falls and levels, at this stage I’ve included the 3 mm crushed glass to the entire surface, raked and hand tamped level with an aluminium screed bar, what you see below is a hand tamp to the perimeters to remove my footprints. 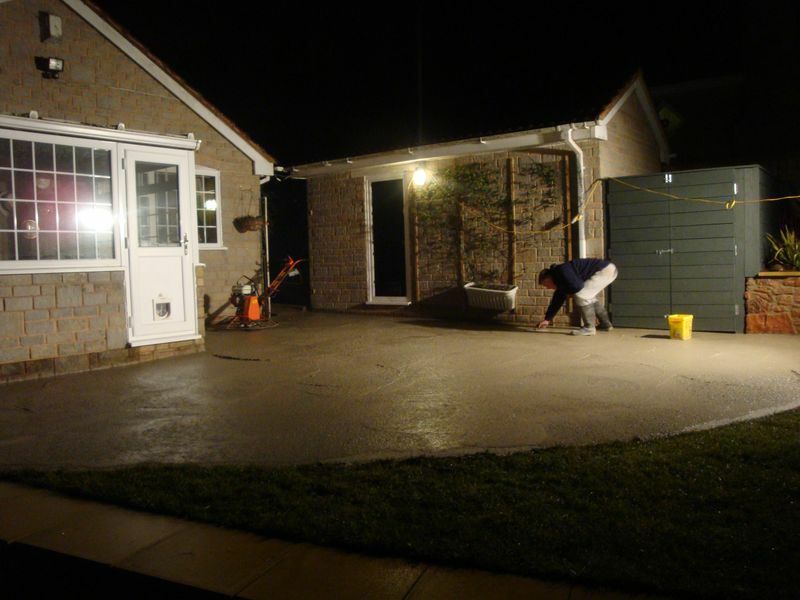 Now that the rain has fallen on the fresh wet slab all I can do is go home and will return later in the evening to start polishing the concrete slab under flood lights, goodness knows what time I’ll finish. Having seen the temperatures are up in the 11-14 degrees tonight and the wind is whipping about the slab should go off sharpish. Now I play the waiting game! 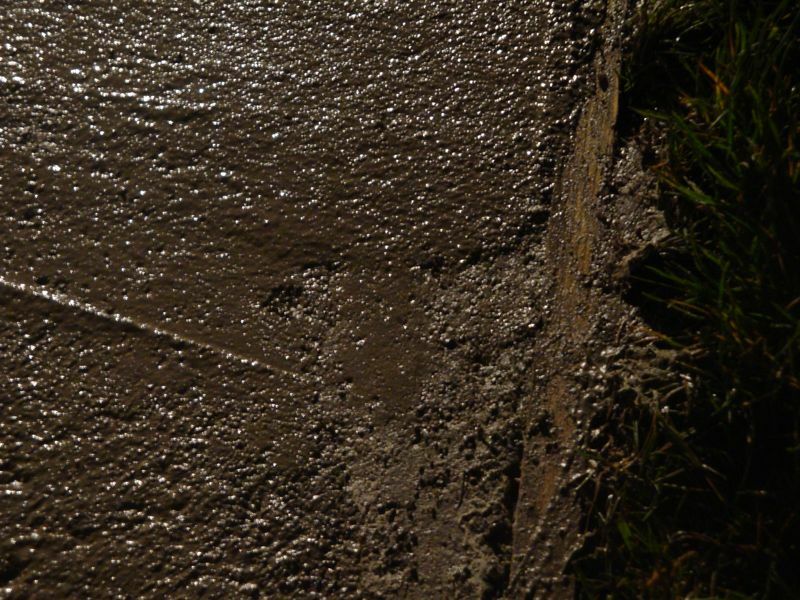 Having returned to the project at 19.00 and plugged the lights in, my first job is to step onto the slab and witness the indentation left by my foot with 12 stone bearing down, I’m looking for a slight footprint left behind, should I drop to my ankles in concrete then its time to return home. So the concrete is going off and I’m back on the job at the correct time bearing in mind the wind, temperatures and amount of rain that fell earlier, the powerfloat was lifted onto the pan, topped up with fuel and fired up. I pan the entire surface keeping an eye on wet or soft spots, I need to stay clear of these soft spots and only whip over the top, the whole purpose of panning the slab is to iron out any ridges and create fat, fat is a concrete cream that I will use to polish the slab to a smooth finish as the night and curing of the concrete allow. The power float will not allow the landscaper to reach the edges because of the skirt guard, so all edges must be towelled by hand, using the fat created from the pan. 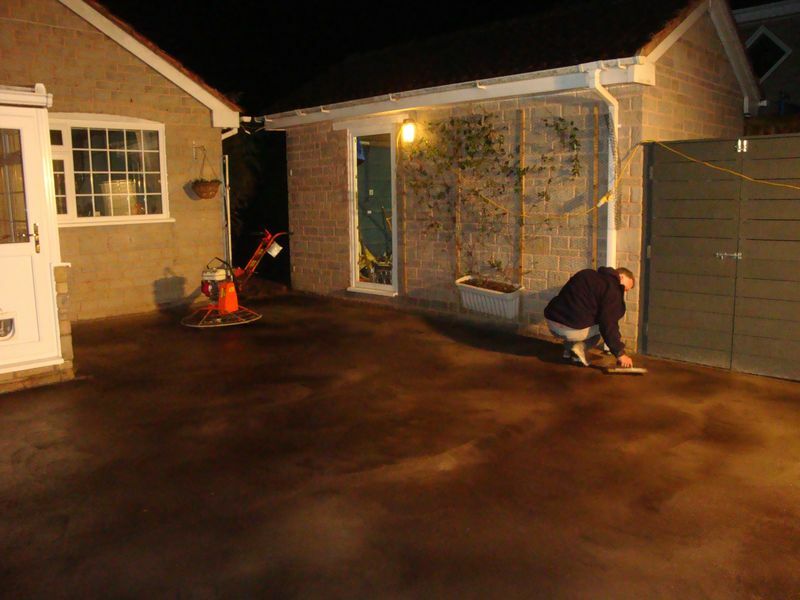 All the perimeters are cleaned and towelled so the entire surface has a film of fat…….all tools and the driveway are washed ready for a return at midnight, this is when I’ll be able to powerfloat the slab with the blades just slightly raised……as a rule of thumb the powerfloat will be applied, after the panning, during the course of the curing process three times, each time the blades are lifted to work the fat in. What a difference this visit was, the fat is now reduced and my footprints are leaving a less prominent indentation behind, the entire surface has been covered in dye, sporadically, and worked in with the power float blades having been wound up so they are around 30-35mm above level. 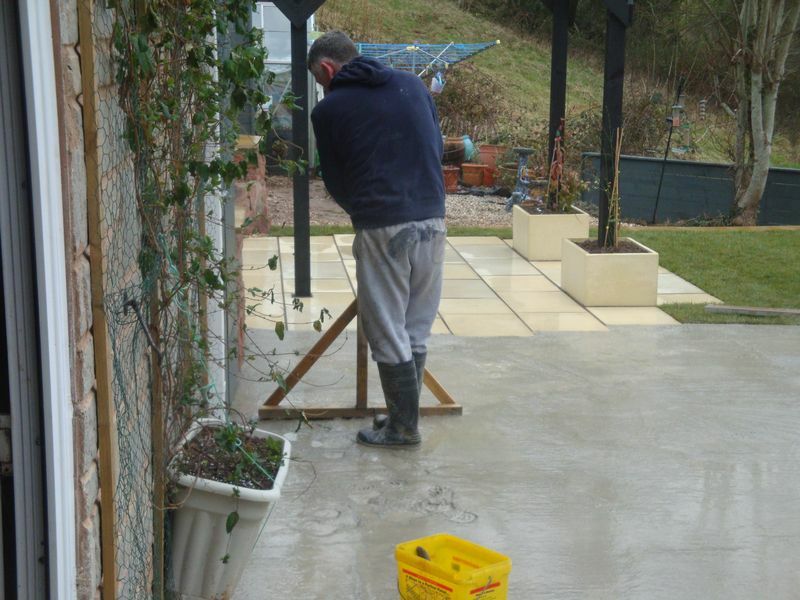 All the perimeter edges have been hand trowelled and paving slabs cleaned off. The alarm is set for 4.30am and I will be back on site for 5.00am to work the fat in even more, from here on I will remain on site until the concrete is completely polished. Having returned to the project at 4.30am I find there is a mist in the air and the slab is still damp to touch and leaving the faintest of footprints when walking over the surface……so I’ve decided I can return at eight to continue and not fall out with the local neighbours, despite them all knowing that had I need to I would not hesitate in pulling the start pully. Time for a light nap! 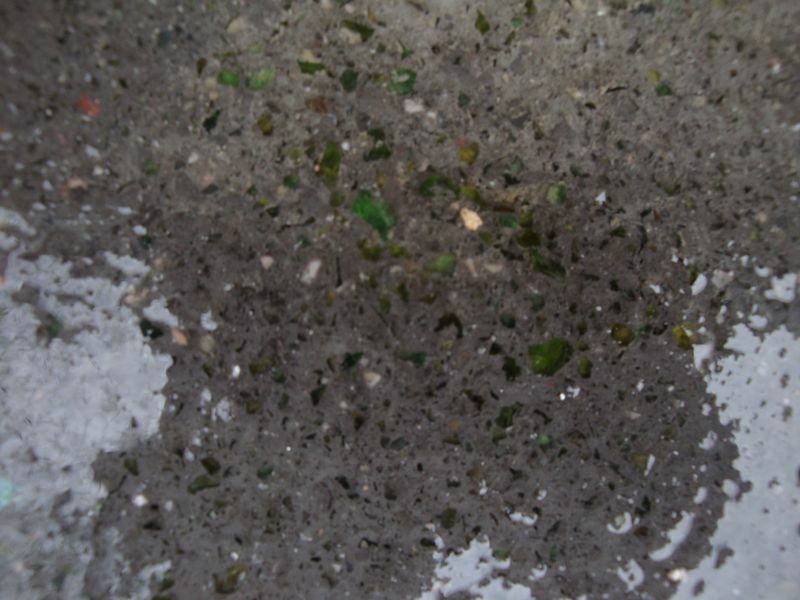 Having had sufficient time for the concrete to cure, I’ve since scrubbed diluted acid onto the surface of the slab to expose the green recycled crushed glass below. 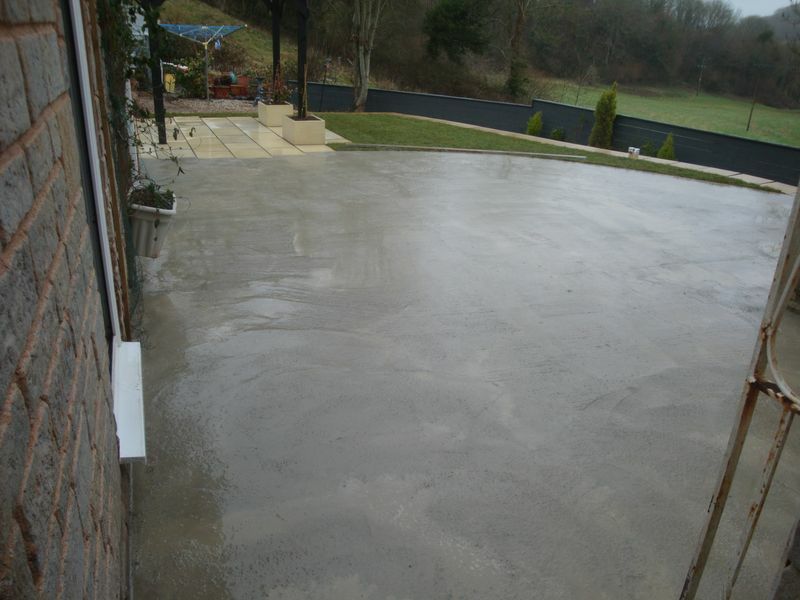 For all enquiries regarding concrete slabs and power floating call 01626 332533, I look forward to your enquiries.